Houston TX Mini Facelift Surgery | Spring Valley Village | Sanaz Harirchian, M.D. Dr. Harirchian’s practice is dedicated to aesthetic and reconstructive surgery of the face. She works exclusively on the face and neck. She combines her artistic eye, perfectionist style, and understanding of the science behind the aging process with cutting edge and advanced face & neck procedures. By focusing only on the face, Dr. Harirchian believes that she can give her patients the best care and outcomes. She can perform different types of facelifts and necklifts, and will tailor her technique to best treat your face and neck. With age, the muscle, connective tissue, ligaments and fat pads of the face and neck descend. The platysma muscle of the neck can lose tone and descend. In addition, changes occur on the microscopic level to the skin and connective tissue. The skin loses collagen and elastin, reducing strength, thereby descending with gravity. The combination of changes in the skin, muscle, connective tissue, and fat pads can result in sagging of the face and neck. The face and neck can be rejuvenated with surgical and nonsurgical techniques, depending on what the patient would like improved. Dr Harirchian will evaluate your face and customize a plan that best works for you. Not all faces are the same, therefore not all surgery and restorative anti-aging techniques should be the same. Different techniques are used depending on the degree of skin laxity, muscle laxity, presence or absence of jowls, skin quality and texture, degree of fat or whether there is a need for volume. Surgical and nonsurgical techniques are often used together. What is a Mini-Facelift or Mini-Lift? This term means different things to different surgeons. Not all facelifts or Mini-Lifts are the same. Repositioning and resuspension of the deeper tissue structures are needed to restore the youthful anatomy of the face. The muscles and connective tissue of the cheek and midface make up the superficial muscular aponeurotic system (SMAS), which lies deep to the skin. The SMAS continues into the neck as the platysma muscle, which is also deep to the skin. The “deep plane” of the face is made up of the SMAS and platysma muscle. 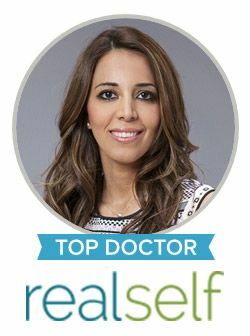 Dr. Harirchian performs a modified deep plane surgical technique to create long lasting, natural, and youthful facelift results. This means that she dissects underneath the “deep plane” of the face, to release ligaments and move muscle and fat layers back to a more natural and youthful position. After the deep structures are tightened and lifted, the excess skin is removed. The goal of Dr Harirchian’s mini-facelift approach is to restore the youthful anatomy of the face by lifting and repositioning the deeper tissues of the face. The focus is not on pulling or lifting skin only. Consequently, patients look natural and never look pulled or “windswept.” Studies have demonstrated that there is a greater longevity to facelift results when the deeper structures are repositioned rather than when the skin is lifted alone. The difference between a facelift and a mini-facelift has to do with the approach to the neck. A full facelift involves a necklift and is best for patients with aging changes in the face and neck. A mini-facelift or a mini-lift is meant for younger patients with aging changes in the face without aging changes in the neck. A mini-facelift can improve the early development of jowls, deep nasolabial folds, descent of the mid-cheek area and laxity in the face. However, it does not rejuvenate the neck. The mini-facelift incision is camouflaged in natural skin creases. The incision typically lies in the temporal hairline, behind the tragus (post-tragal), and around the ear lobule. Dr. Harirchian’s philosophy is to ensure maximal results with the most minimally invasive techniques. Natural and long-lasting results are her priority, and she will not compromise maximal results for a “mini” procedure. Contact us today to schedule your appointment. During the consultation, Dr. Harirchian will evaluate your face and customize a plan that best works for you after a thorough discussion.